We have selected the following articles published in 2013. 1) Our first study presents an interface code between the APMO program and the electronic structure package MOLPRO. The any particle molecular orbital APMO code implements the model where electrons and light nuclei are treated simultaneously at Hartree-Fock or second-order Möller-Plesset levels of theory. The APMO-MOLPRO interface allows to include high-level electronic correlation as implemented in the MOLPRO package and to describe nuclear quantum effects at Hartree-Fock level of theory with the APMO code. Different model systems illustrate the implementation: 4He2 dimer as a protype of a weakly bound van der Waals system; isotopomers of [He–H–He]+ molecule as an example of a hydrogen bonded system; and molecular hydrogen to compare with very accurate non-Born-Oppenheimer calculations. The possible improvements and future developments are outlined. This study involved an intense collaboration with the group of Andres Reyes (Universidad de Colombia). The Journal of Chemical Physics, 2013, 138 (18), 184113. 2) Our second selected article focuses on Coriolis effects, induced by the molecular rotation, on doped helium clusters. These effects are unravelled by calculating the vib-rotational Raman spectra of (3,4He)4–Cl2(X) clusters as a function of the temperature. Quantum Chemistry-like calculations using the Full-Configuration-Interaction Nuclear-Orbital approach reveal the key role of spin-dependent couplings in fermionic clusters at very low temperatures (0.07 K) for the first time, signaling the effective decoupling of the spin angular momentum from the molecular rotation. On the other hand, the spectra of bosonic (spinless) (4He4)–Cl2 clusters are almost unperturbed by Coriolis couplings at the considered temperature range (1–0.37 K). 3) Our third selected article is essentially an review of the Full-Configuration-Interaction Nuclear-Orbital approach. The Full-Configuration-Interaction Nuclear-Orbital (FCI-NO) approach [J. Chem. 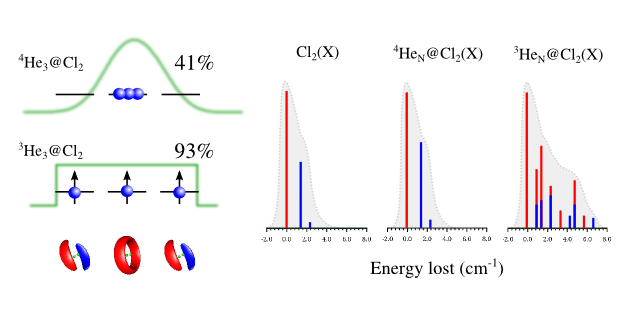 Phys., 2009, 131, 19401], as the implementation of the quantum-chemistry ansatz, is overviewed and applied to (He)N–Cl2(X) clusters (N ≤ 4). The ground and excited states of both fermionic 3He and bosonic 4He [see also, J. Phys. Chem. Lett., 2012, 2, 2145] clusters are studied. It is shown that the FCI-NO approach allows us to overcome three main difficulties: (1) the Fermi–Dirac (Bose–Einstein) nuclear statistics; (2) the wide (highly anharmonic) amplitudes of the He–dopant and He–He motions; and (3) both the weakly attractive (long-range) and the strongly repulsive (short-range) interaction between the helium atoms. Special emphasis is placed on the dependence of the cluster properties on the number of helium atoms, and on the comparison between the two helium isotopes. In particular, we analyze the analogies between quantum rings comprising electrons and 3He atoms. The synthetic vibro-rotational Raman spectra of Cl2(X) immersed in (3,4He)N clusters (N ≤ 4) are discussed as a function of the cluster size and the nuclear statistics. It is shown that the Coriolis couplings play a key role in modifying the spectral dopant profile in 3He. Finally, we point out possible directions for future research using the quantum-chemistry ansatz.